DODGE has created a road legal dragster, pure and simple. Legal to register it may be, but the things the 2018 Challenger SRT Demon are capable of are most certainly illegal, unless you unleash its potential at the drag strip rather than the car park outside Woolies. Many may deem its performance a dangerous irrelevance for a street car, but you can't help but marvel at the numbers involved here. 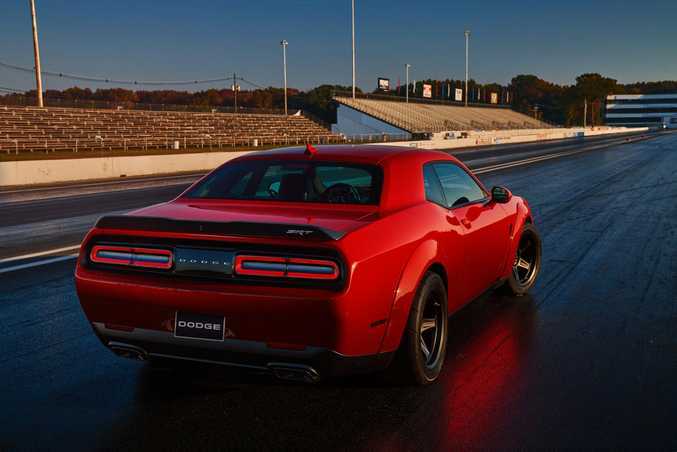 Much kudos to Dodge for having the guts to offer it to an eager buying American public, especially with a full factory warranty (three years the car, five years the powertrain). 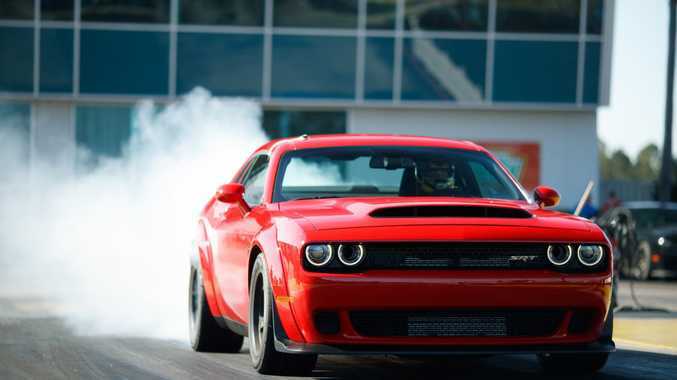 Using a supercharged 6.2-litre Hemi Demon V8 it produces 626kW and 1044Nm, hits 60mph (97kmh) in 2.3 seconds and sprints the quarter-mile in just 9.65 seconds. Wow. The model has been officially banned by the NHRA for being too fast for the drag strip without having the required full safety gear, and emphasising the power on offer here, it's apparently the first time front wheel lift has been recorded in a production car - the Demon performing a wheelie for 89cm. 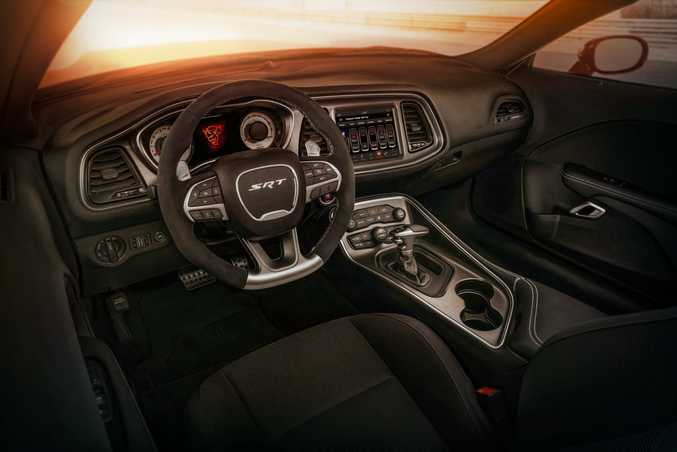 A limited edition model, 3000 Challenger SRT Demons are destined for American buyers and a further 300 for Canadians. The Demon replaces the 527kW Charger SRT Hellcat and Challenger SRT Hellcat models from 2014 as the most powerful muscle cars ever. 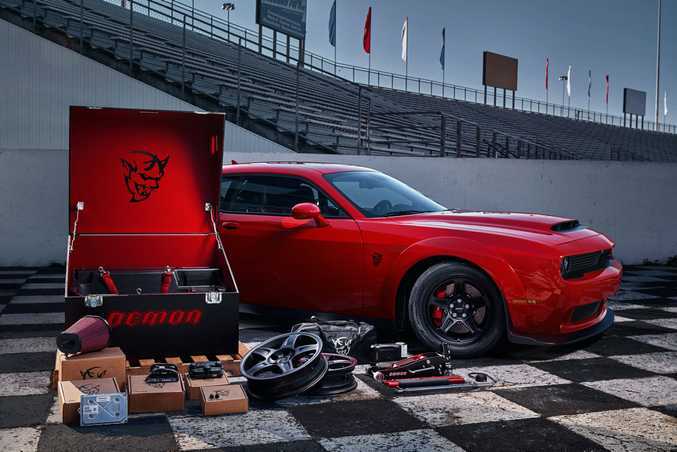 The red-painted Demon engine has 25 major component upgrades from a Hellcat engine including a larger supercharger (now 2.7-litres), increased boost pressure (now 14.5psi), higher rpm limit (now 6500rpm) and a larger induction airbox drawing from three intake sources, including the less-than-subtle Air Grabber bonnet with the largest functional bonnet scoop of any production car. Power goes through the rear wheels only (smoke, anyone?) via an eight-speed TorqueFlite automatic gearbox. While the Demon is designed to run on 100+ unleaded high-octane fuel, as commonly found at drag strips, it will also happily run on 91 unleaded found at the local servo. Obviously, such a weapon loses out on a few practical measures if you expect to realise those top performance figures. The front passenger seat and rear seat have been deleted to reduce weight (but they can be optioned back for $1 each), while also missing are the audio system, boot trim, spare wheel cover and modern toys like the parking sensors. Other clever touches are a Drag Mode Launch Assist to prevent wheel hop, Bilstein Adaptive damping shock absorbers, selectable drive modes (including Drag Mode) and two different key fobs. Why? There's a black fob that when used limits the engine to 373kW, while the red one is for when you're happy to take the full 626kW. No news on what the lucky North Americans will have to pay for one of these Demons, but we'd suggest demand will most certainly outstrip supply. - Most powerful muscle car ever (626kW/1044Nm). - Highest horsepower V8 production car engine ever made. - First ever front wheel lift (a wheelie) in a production car (89cm). 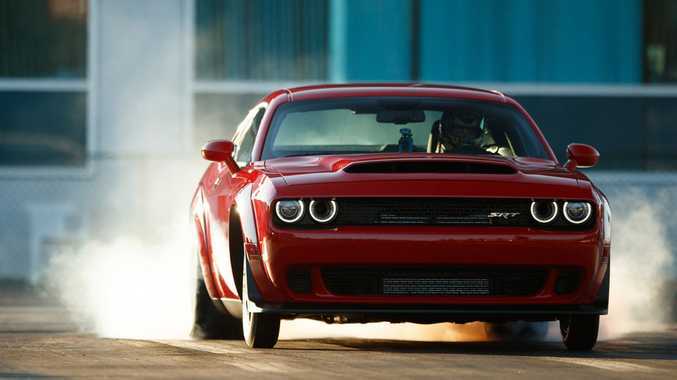 - Fastest 1/4-mile production car with an elapsed time (ET) of 9.65-seconds @ 225kmh. - World's fastest 0-60mph (96kmh) production car: 2.3-seconds. - First ever factory-production car with front passenger seat delete. - Largest functional bonnet scoop of any production car. - First production car fitted with street-legal drag racing tyres (315/40R18 Nitto NT05R).